After these terms have been reviewed and a brief discussion around their importance in our inclusive classrooms has occurred, the group is ready to play “Cash Cab”. The facilitator can choose to have each individual play the game separately on their own devices, or as one large group. Open the Cash Cab PowerPoint file. Begin the game. It is recommended that the players are given a specified time to answer each question to ensure that the group stays on track. To check if an answer is correct, click the cursor inside the question box and the answer will appear. If the given answer is correct (meaning that it matches the answer that is displayed), click the green button on the bottom of the screen. If the given answer is incorrect, click red button on the bottom of the screen. It will direct you to the correct slide, given the number of strikes accumulated. If a question is answered incorrectly, a strike will be given. The strikes will be displayed in the box on the left-hand side of the screen. Three strikes and you are out of the cab! If 8 questions are answered correctly in a row, then the player can attempted the Red Light Challenge. Click the red box in the top right-hand corner to begin the timer. 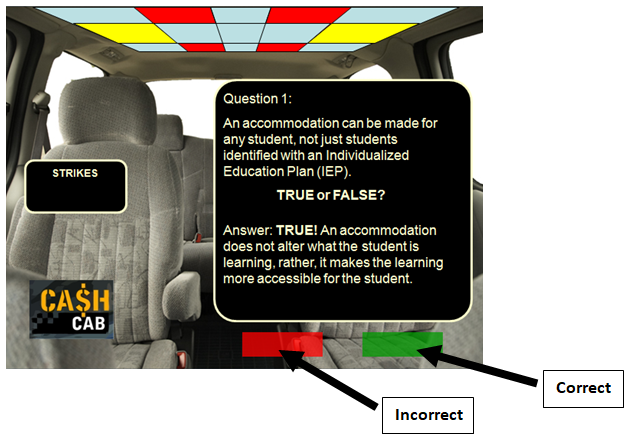 The player then has 30 seconds to answer the question by identifying the environmental accommodations present in the list. If the player answers correctly, click the green button on the bottom of the screen and award the player additional points. At the end of the game, the player can either choose to take the points they have earned or go double-or-nothing on the video bonus question. Points being awarded are at the discretion of the facilitator. This activity will provide a good opportunity to challenge individuals on their knowledge of accommodations and modifications. This challenge should spark a rich dialogue about how to identify when an accommodation or modification is required, what accommodations or modifications are effective in which situations, and which students in our own learning environment may require additional supports. It is important to remind the players that decision making around implementing accommodations and modifications are based on the child’s individual and unique needs. 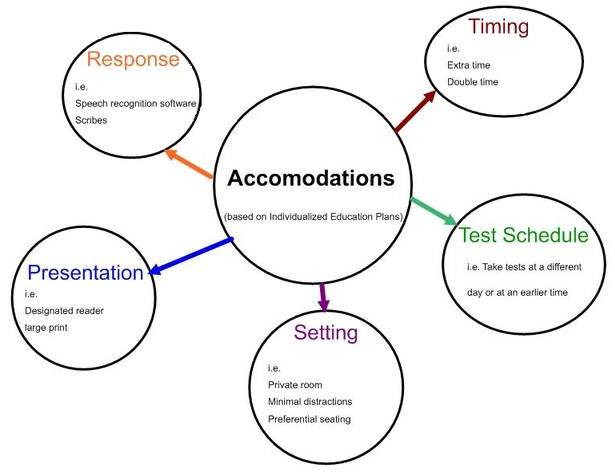 Additionally, it is important to mention that accommodations and modifications should consistently be evaluated after they have been implemented (Are they effective? Are more supports required? 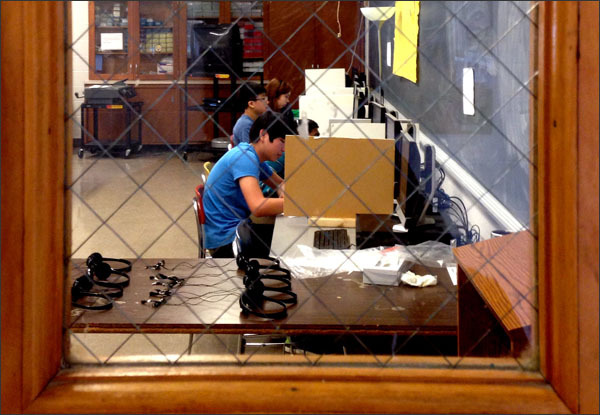 Does the student still require the supports being provided?). Fisher, Stacy. “Free PowerPoint Game Templates for Teachers.” The Balance. N.p., n.d. Web. 02 June 2017. The Individual Education Plan (IEP): A Resource Guide. Toronto: Ministry of Education, 2004. Print. In the case of Hannah on page 125 of Special Education in Ontario Schools, we learn about the continual behavioural incidences that occurred between nursery school and her current grade 4 year. Hannah always seemed to be on the move and would run until someone or something stopped her. She regularly blurts out anything on her mind. Hannah has a history of borrowing things without permission and failing to return the items until she is explicitly asked to do so. Hannah has a difficult time making connections with her classmates and often interferes with their learning during group work. This is becoming an increasing social issue, especially because Hannah seems to be unaware of how her actions are affecting (and annoying) her classmates. She has even been rejected from class fieldtrips for her past behaviour, even with her mother as a mentor. In grade 3, Hannah was diagnosed with ADHD, however, she is currently not medicated. With the untreated ADHD and subsequent behavioural issues, Hannah has been identified as lagging behind her peers academically. Hannah’s classmates and their parents have categorized her as a problem and refuse to accept her in social circles or group projects, which has led Hannah to become very emotional and distraught. It is important that classroom instruction is differentiated to meet Hannah’s current level of subject matter comprehension, ensuring that the work is not too advanced or unachievable given her current academic struggles. In an effort to capture and maintain Hannah’s attention throughout instructional periods, various forms of media (Chromebooks, magazines, YouTube videos) and visual aids (anchor charts, drawings, images) should be incorporated into lessons. Providing step-by-step instructions that are manageable and achievable within Hannah’s threshold of attention will ensure that she does not wander or become disengaged in her learning (Bennett et al, p. 126). It is also important to provide extra assistance at the beginning of a new activity so that she has goals and objectives outlined that she needs to achieve. Classroom instructions should be delivered in close proximity to Hannah so that the audio and visual distractions are limited and the focus is solely on the educator (Bennett et al, p. 126). Additionally, it is important that Hannah is provided with regular reinforcement and celebrations to motivate her, acknowledge her progress and achievements, and to show the other students that she is a valued member of the classroom community. A suggested way that Hannah could appropriately channel her energy, especially during quiet work periods, is by having an exercise bike in the classroom or replacing her chair with a yoga ball. An important consideration when placing Hannah in the classroom is to ensure that windows or other highly stimulating areas in the classroom are considered and/or altered if distractions occur. It is also important that Hannah is placed in a location within the classroom in which she can stay focused at be successful, such as away from the classroom door and other areas of high traffic. However, it is also important that Hannah is not isolated from her peers in a study carrel or “solo” desk, given that she doesn’t have strong peer relationships as it is. It may even be of benefit to Hannah’s social connections to establish a peer mentor/buddy that Hannah could sit with. This student would naturally be a liaison between Hannah and the rest of her classmates, helping to reduce negative stigmas attached to her and to establish positive peer relationships. Following a discussion with Hannah about positive self-regulation strategies, an image of the Zones of Regulation could be taped to the corner of her desk so that she is consistently aware of her behaviour and is reminded of appropriate strategies (http://www.zonesofregulation.com). Hannah should also be allowed to listen to music during work periods in an attempt to keep her focused and avoid potential opportunities to distract her peers. In direct correlation with the instructional accommodations, it is important to differentiate pieces of assessment to meet Hannah’s current level of comprehension. It is important to outline step-by-step instructions on all pieces of assessment so that Hannah has an outlined process that she must follow and items that she can check off once completed. In addition to the step-by-step instruction, the educator can create goals with Hannah in respect to deadlines and success criteria. A way to focus Hannah on the task at hand would be to assist her with organizing her work and thoughts at the beginning of the assessment (Bennett et al, p. 126). Frequent check-ins throughout the assessment process would ensure that Hannah is on task and understanding the content being explored. Incorporating visual aids would help to spark Hannah’s interest in the assessment and, ideally, engage her throughout the process. There are a few other foreseen issues that Hannah may experience if these supports are not put into place. If a stable routine is not put into place, then the coping strategies that Hannah is working on may become difficult to utilize in unpredictable situations. However, once a classroom routine is established, Hannah will know when it is appropriate to do what (i.e. listen to music). It is almost important that while the educator must be flexible and adaptable given Hannah’s varying behaviours, firm expectations about appropriate classroom behaviour should be created and discussed with Hannah. This will allow her to become more self-aware of her behaviour and its ramifications, especially if teacher prompts have become exhausted. This is a crucial time in Hannah’s academic development. It is imperative that her distractions are limited so that her academic achievement increases to a grade-appropriate level. Perhaps even more pressing is Hannah’s social development. As previously mentioned, she has established a negative reputation among her classmates and their parents. This can be very damaging for Hannah’s self-esteem and overall self-image. It is very important that the classroom teacher works with Hannah and her peers, through restorative justice and community building initiatives to mend Hannah’s relationships with her peers and provide her with a supportive and accepting social circle (Ministry of Education, p. 36). I believe that through the implementation of the suggested accommodations and considerations, Hannah can be set up for a successful academic and social development. Bennett, S., Weber, K. J., Dworet, D., & Weber, K. J. (2008). Special education in Ontario schools. Niagara-on-the-Lake, Ont. : Highland Press. Ontario Ministry of Education (2010). Caring and safe schools in Ontario: supporting students with special education needs through progressive discipline, kindergarten to grade 12. Toronto: Queens Printer for Ontario. Can using labels and categories of exceptionality help move towards a more inclusive educational environment? Why are such labels important and needed by teachers? What are some of the issues with these labels of categorization? When approaching the topic of labels and categories, I have conflicting feelings and opinions. Labels are used to help classify specific characteristics and behaviours as they relate to exceptionalities. This helps educators understand, predict, and support behaviours that are associated with the label given. I believe the main positive aspect of labels and categories is the understanding that follows. When educators are open to exploring the “background story” of their students, they begin to develop empathy and move towards a place of acceptance. I have experienced situations where labels have either benefited or disadvantaged the person being labelled. Some students who have been given a label feel as though there is a neon light hanging above them with the name of that label; they feel as though that is all they are known as and are ostracized or viewed differently because of that. On the other hand, my cousin had been going through a very difficult time as a student both academically and socially, and was further conflicted because she didn’t know “why” she was different. When we eventually sought support and received her “label”, she felt as ease knowing that there was community of other students who were having similar experiences. When we make an effort to get to know each student on an individual basis, the label starts to dissolve and the true person comes into existence. 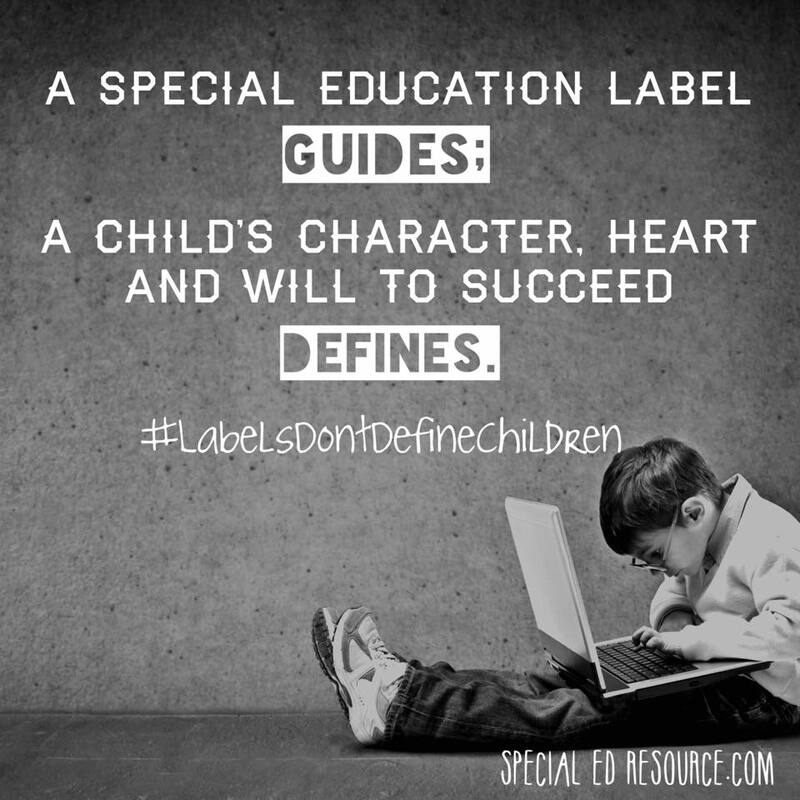 Labels may help with the initial understanding of the student, but when we get to know them personally and are able to meet their needs, that is an inclusive education environment.